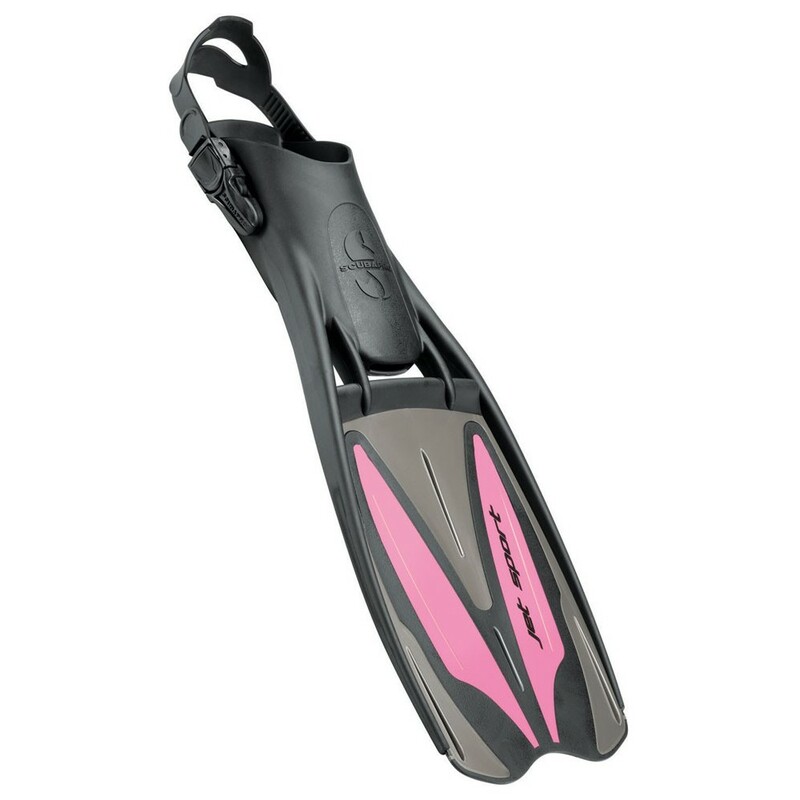 AFFORDABLE PERFORMANCE If you're a fan of traditional blade fins, this comfortable kicker will definitely impress with its power, acceleration and maneuverability, not to mention its price. The JET SPORT ADJUSTABLE offers much more than just stylish good looks. It also lightweight and comfortable, plus delivers solid kicking performance. The JET SPORT ADJUSTABLE's big, slightly stiff blade is a tri-material design featuring a pair of soft rubber panels framed in semi-stiff plastic and flanked by thin side rails, producing just the right amount of flex. There are also drag-reducing vents between the blade and foot pocket to decrease resistance on both up and down strokes. This combination generates propulsive kicking power, provides good stability and makes efficient work of frog and dolphin kicks. The fin is easy to maneuver too -- very responsive in turns and at backing you out of tight spots. The rubber foot pocket molds comfortably to your foot, and the strap adjustments and quick-release buckles make donning and doffing the JET SPORT ADJUSTABLE oh-so-easy. Underneath, an effective non-skid pattern does a good job of keeping your feet underneath you when moving around on wet decks. The JET SPORT ADJUSTABLE is a perfect choice for any diver looking for solid kicking performance in a more traditional blade fin. 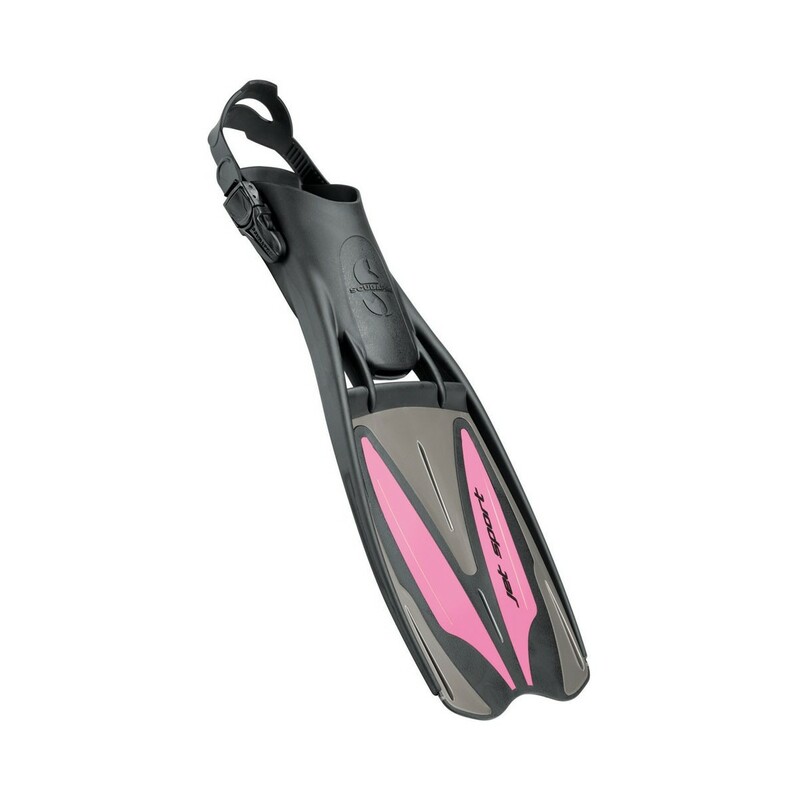 It is comfortable, powerful and maneuverable, and that makes life spent under water just that much more enjoyable. • Three-material blade construction optimizes flex to maximize kicking performance. • Drag reducing vents substantially decrease resistance on both up and down strokes. 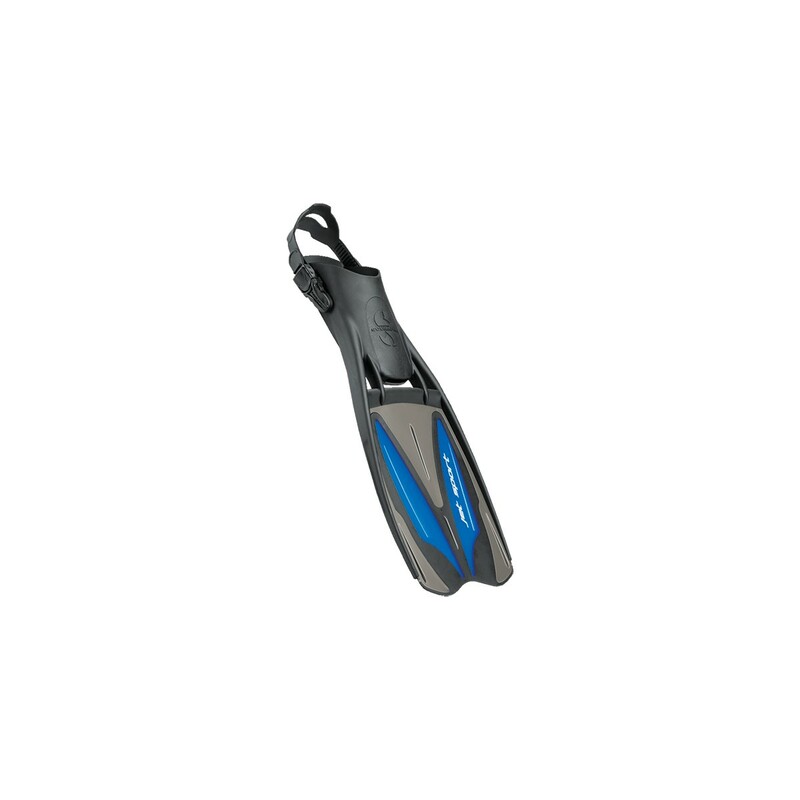 • Big blade generates a powerful response in the water and improves stability and maneuverability. • Ergonomic foot pocket molds to your foot for total comfort during long dives. • Quick release buckles simplify strap adjustment and make donning and doffing easy. • Effective non-skid pattern protects against slips on wet surfaces. • Extra-small sizing is ideal for smaller feet and young divers.